Every business needs to have an online presence these days. That applies to real estate businesses. We have covered a bunch of awesome real estate themes here in the past. EstateEngine is another premium theme that lets you build a professional presence for your business. It comes with various property management features, enabling you to share all the relevant information about each property with your audience. EstateEngine has a modular design. You can drag and drop content blocks to customize them in the frontend. The theme offers Google Maps integration. It comes integrated with PayPal and 2Checkout. You can define custom payment plans easily. Of course, you can always add ads to your website to monetize your content. The theme is mobile friendly and ready to be translated. 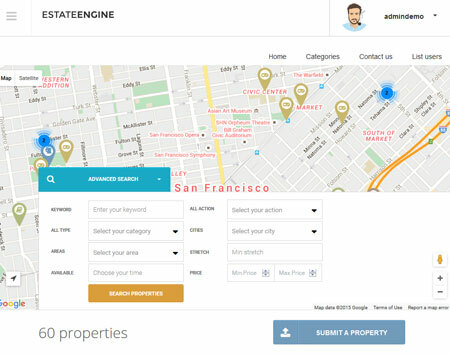 EstateEngine lets you customize it from the front-end and back-end. It also has premium extensions that let you add even more features to your website. This is a commercial real estate theme.